Every spring, around Easter time, the start of the golf season begins for the USA in Augusta, Georgia. The Masters is when we golfers watch our annual trip through Augusta National. With fairways and putting surfaces so green they put St. Patrick’s Day to shame. A scarce few of us get to play the course. A few more of us visit and watch the tradition like no other in person. The majority of us, though, are happy to watch the event over four days in April on HiDef TV. Brothers and sisters there is hope. Because in Eugene, Oregon, the home of the University of Oregon Ducks, has its own emerald jewel. 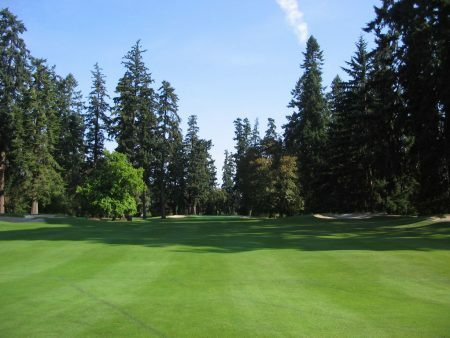 A classic Pacific Northwest layout framed by towering firs sits the Eugene Country Club. 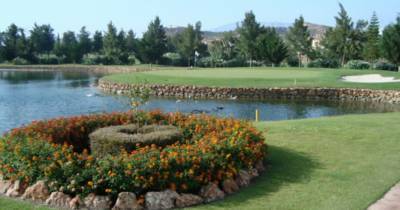 The course offers attractive water features, impressive par 3s, and immaculate conditioning. As for putting, the greens are just a few Stimps short of USGA fast. But dead accurate if you can prejudge the speed and line. 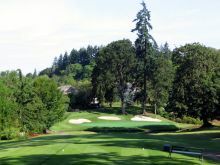 The Eugene Country Club began in 1899. It is the second oldest country club in Oregon.. The Club’s first golf course was a nine hole layout with sand greens. Robert Trent Jones redesigned the original 1925 H. Chandler Egan layout in 1967. Jones widened the playing corridors, expanded the greens, and added bunkers. Jones reversed the original Egan routing by placing the first tee near Egan’s 18th green, and so on. He routed just two holes from the Egan design (#7 and #12). Jones built up the green complexes and teeing areas, doing little to the original 16 fairways. The reversal of the routing allowed him to add lakes and waterways to the course of play. There are soft undulations in the property help make the course a comfortable walk. Carts are also available. The signature hole for me is the par three #5. Although the hole plays downhill from all but one tee box, a breeze can often knock down shots. A pond guards the front and right side of the green. Going after hole positions in the front part of the green can be risky. Hitting over the green will leave you with a difficult downhill chip or bunker shot. Bunkers dot the entire rear hillside. Also, note that the markings on the water hazard. Both yellow and red stakes, depending on the location, are along the waterway. The club has hosted many USGA and NCAA championships. A few weeks before my game they played the 2016 NCAA Championship there. The ECC will again be on stage for the 2018 U.S. Senior Amateur. If you enjoy magnificent tree lined courses the Eugene Country Club is to be one of your favorites. Seeing the Golden Gate Bridge being enwrapped with a cape of fog, riding up to the top of the Coit Tower, the Sutra Baths at Ocean Beach or Golden Gate Park on a Sunday when cars are prohibited are at the top of every vacationer’s list. San Francisco is one of the great destinations to enjoy. For some, it could be recalling one’s youth on the corner of Haight and Ashbury, where the clock is always at 4:20. Alcatraz, Fisherman’s Wharf, Pier 39 for the sea lions and Ghirardelli’s for chocolate and ice cream, City Lights, well, the City offers more to do than you’ll have days to see it all. Another thing that San Francisco offers is some wonderful golf. Like St. Andrew’s in Scotland, prices for the local player are reasonable due to city’s reduced resident’s fees. Prices to the visitor are not inexpensive but well within reason for the quality of play. In the city, Presidio was the choice. About 40 minutes north in Marin County, Peacock Gap gets a nod. 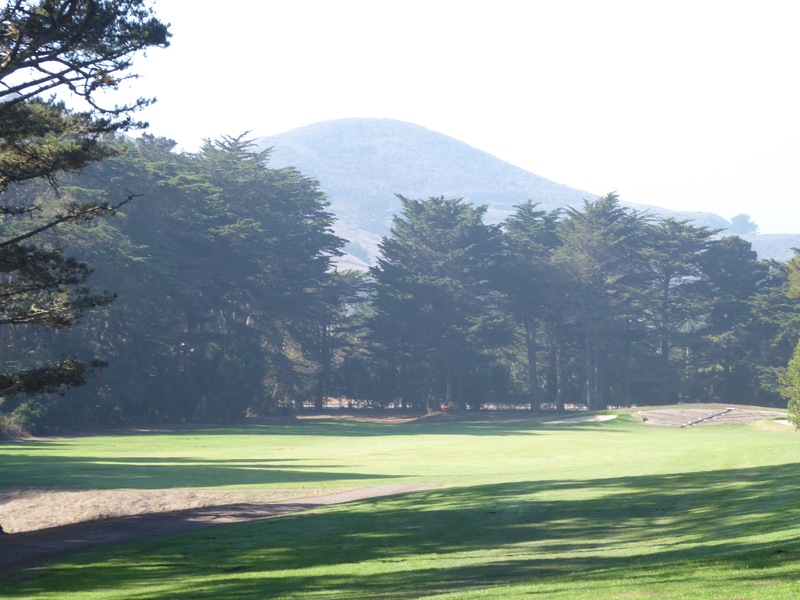 10 minutes south of downtown, in Pacifica, lies a great public golf course designed by Alister MacKenzie, the designer of Augusta National. The attraction to Peacock Gap was the thought that it would be walkable. Let’s face it, they don’t talk about the hills of San Francisco for nothing. Peacock Gap is not only walkable, it had to be the most laid back golf club I’ve ever played. The staff is friendly, helpful and has none of that stuck up ‘I work at a golf club’ attitude anywhere. Established in 1960, Peacock Gap was originally designed by William F. Bell—the same designer behind Torrey Pines. Bell took over the business from his father, William P. and their handiwork is prevalent throughout California and the West Coast, especially after WWII to the 60s. Updated with a host of state-of-the-art features and practice facilities in 2011—including Marin County’s only all-grass driving range, a brand-new Clubhouse, and renovated greens and fairways. There’s a drought going on in California so there are plenty of brown grass spots. The playability of the course was excellent. Fairways and greens were well maintained and the clubhouse provided large cups of ice water for all players. The course architecture invites, challenges, and intrigues—in the spirit of vintage courses. Inviting because of the wide fairways, challenges from bunkering and water guarding greens and I guess the intrigue comes from the directions from Hwy. 101. Check out the views from Point San Pedro Road. Remember Pelican Gap if the Bay and city are foggy. Once through the Waldo the Rainbow the Robin Williams tunnel the mist and fog are behind you. Enjoy yourself. Inside a former military garrison lies one of the oldest golf courses on the West coast. The Presidio Golf Course has a storied history. It was built in 1895 when Colonel William M. Graham, the Presidio’s commander at the time, allowed a group of businessmen known as the San Francisco Golf and Country Club to create a nine-hole course within the post. The course was ultimately expanded to a full 18 holes in 1910. Sometimes the course was called into service for non-recreational purposes. President Theodore Roosevelt reviewed the troops on the links in May 1903. Three years later, the course was used as a refugee camp for survivors of the 1906 earthquake. When the Presidio became a national park site, the course was opened to the public, and a new clubhouse, open to the public, was built in 1999. The early Presidio Golf Course was short, but challenging. Players are surprised by the course’s level of difficulty and its natural obstacles. Thirteen holes are uphill, some go uphill and the next hole goes up higher. Presidio, is designed with tight fairways and strategically placed bunkers. 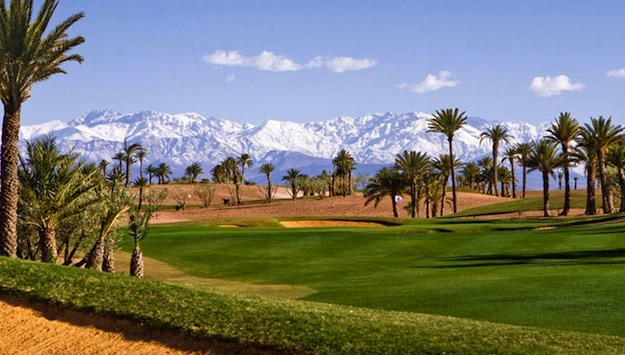 This 18-hole big time hilly golf course offers a unique challenge for golfers of all abilities. Presidio, sitting on a large hill, has great vistas of the city of San Francisco. Though it sits at the foot of the Golden Gate, it has no view of the bridge. The elements definitely come into play at Presidio. It can offer powerful winds, rain, fog, sudden gusts, and sometimes all four on any given round. Fortunately for me it was sunny and mild but later in the round it got kite flying breezy. Unless you are in Triathlon shape or named Edmond Hillary, this is not a walking course, though I saw many golfers doing so. One golfer I was paired with started walking but retired after nine. Part of the difficulty is just the physical work needed to walk the course. What did I do? I chose discretion over valor, enjoyment over struggle, and used a cart. Nonetheless, Presidio checks all the boxes and it would be a shame if you passed on the opportunity to play on this special and historic golf course. 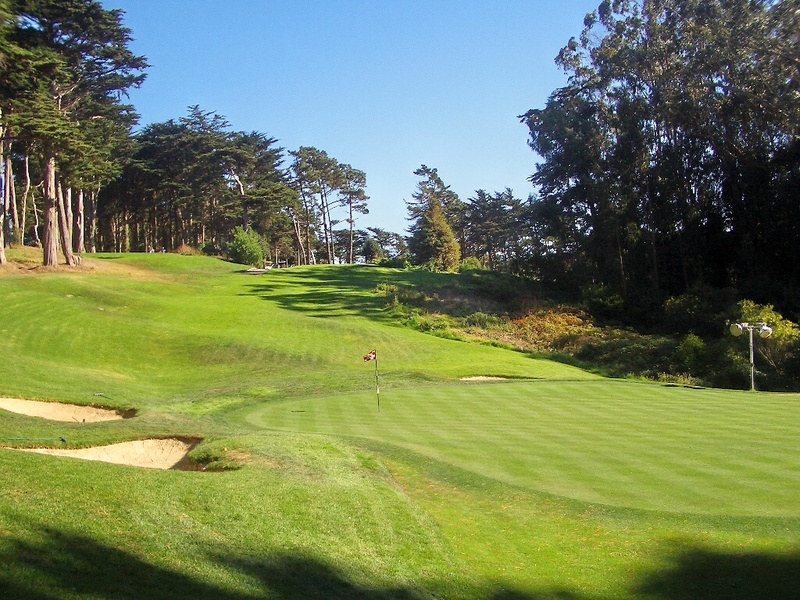 Fresh off the design and building of Cypress Point and in the early stages of building Augusta National, Alister Mackenzie, at the time, a Bay Area resident, was hired to design Sharp Park. Sharp Park achieved Mackenzie’s dream of using cheap municipal golf to “help enormously in increasing the health, the virility and the prosperity of nations.” While today’s design features 12 of the original green complexes in deteriorated form, Mackenzie would surely embrace Sharp Park’s continued affordability, accessibility and friendly atmosphere. Stark Park, while located in Pacifica, is operated by the San Francisco Parks Department. The course is located 10 miles south of San Francisco at the intersection of Sharp Park Road and the Coast Highway. Often called “The Poor Man’s Pebble Beach,” the par 72 course is 6,300 yards long and offers fabulous views of the surrounding headlands and mountains. Built as a seaside course, the golf course has been denied its position on the beach of the Pacific Ocean. Terrific storms have caused sea water flooding, so a massive dike was built to prevent storm water from coming in. Unfortunately it has also cut off any views of the ocean. You can walk off the #16 green, climb up a huge driftwood log and stretch over the chain link fence to see the Pacifica pier and a fabulous Pacific Ocean vista. 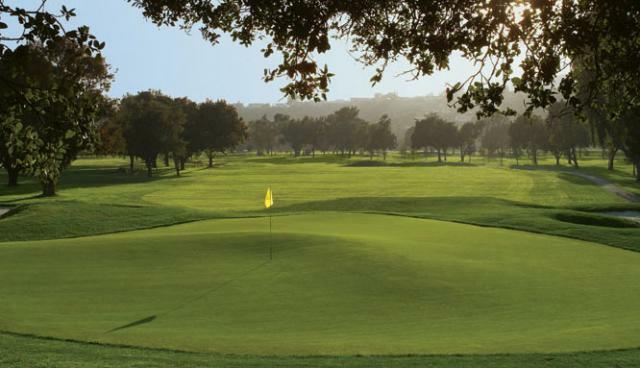 In 2014, Golfweek Magazine named Sharp Park among America’s 50 Greatest Municipal Courses. Sharp Park is a walkable seaside and inland course, with several holes that wrap around Laguna Salada, a natural lake. Generously wide fairways ( a MacKenzie trait) are watered by the Laguna Salada, a marshy lake inhabited by gangs of birds and waterfowl. Greens are in pretty darned good shape for a muni. Despite the drought, plenty of moisture in the sea air translates into a greener than usual look on the course compared to the area’s other golf courses. There is one caveat. For nearly a decade, Sharp Park was embroiled in a legal contest between the park and environmentalists. Finally the courts ruled in favor of the golf course and San Francisco is investing money to give the park a needed face lift. Holes 4, 5, 6 and 7 greens are being restored with new drainage installed to prevent the annual flooding of the low lying ground. The Works Progress Administration provided jobs and income to the unemployed during the Great Depression in the United States. The Spanish hacienda clubhouse at Sharp Park was a WPA construction project. Adding to the vintage feel are vivid Depression-era paintings, beamed ceilings and an old-fashioned starter’s booth and tiny pro shop. Stark Park has the look of a run down facility but don’t let the looks deter your playing this exceptional golf course. Like a dignified elderly woman whose tasteful and elegant clothing is a bit frayed from age and use, Stark Park is also tattered and worn. However, the old girl still has a twinkle in her eye that will leave an impression like no other. Over the centuries, many visitors, welcome or not, have traveled to Sicily for rest, relaxation and the occasional occupation. Sicilians are known for their great pizza; expressive conversation and their unique look at family values and organizational skills. 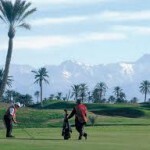 What has never been mentioned has been Sicilian golf, until now. What happens when you take one of the world’s foremost luxury hotel visionaries and a modern golf course designer dedicated to creating golf courses inspired from the classic courses of Great Britain and continental Europe? You create a remarkable resort called Verdura. Verdura is located on the southwest coast of Sicily near the fishing village of Sciacca. The resort is the latest in the Rocco Forte Collection of highly individual and luxurious hotels and resorts. Verdura is set over the stunning landscape of Sicily’s coastline giving a true sense of space and privacy. All rooms have private terraces with undisturbed Mediterranian views and interiors that combine every modern luxury with authentic Sicilian motifs. The care and attention to detail is manifest in every aspect of the resort. From the spacious and comfortable living areas to the opulent spa, every wish that a guest may dream seems to be already thought of. In addition, the staff genuinely cares for your comfort. There is always a friendly acknowledgement and quick response to your requests. 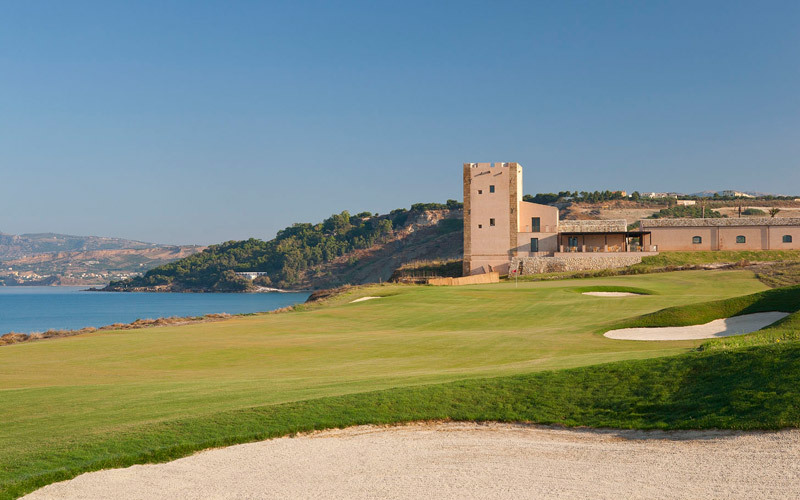 Sir Rocco Forte has found a beautiful piece of seafront ground where he’s developing this five star hotel, 36 holes of championship golf, plus a nine-hole par three course and full practice facility. Kyle Phillips designs the golf course. Phillips is familiar to Swedish golf as the designer of the PGA of Sweden National Golf Course outside of Malmö. Verdura is a shoreline property utilizing a low-impact environmental concept, where only electric vehicles will be allowed inside the resort. Golf purists will love it! Phillips is trying to give it a links land feel, with a rugged seaside look, transitioning to large, rolling, natural features as it moves back away from the sea. It is gratifying that you can be at the most inland part of the site, but still feel connected to the sea. The feel is similar to the feeling at Kingsbarns, in Scotland. The goal is to create a firm fast surface; with greens and bunkering that have a links style feeling to them. Both courses have roughly equal amounts of seaside and inland parts, and so it is possible a composite course that features the ocean holes could be created. While there seem to be no “signature” holes, the overall design seems to blend effortlessly into the landscape it occupies. As they mature, the golf courses at Verdura will take on a “timeless” spirit, as if they have been played on for decades. Phillips has accomplished a design feat. Verdura is a golf course where no hole stands out from another, but the overall impression after a round is not just satisfying, but leaves you wanting to play more. Another unusual feature of Verdura is that Phillips was also the project planner. This allows the hotel, restaurants, spa and golf course and clubhouse to seamlessly flow through the property. None of the resort attractions requires alternative transportation. All are just a stretch of the leg from one to another. The golf courses at Verdura are young, but Phillips’ history is that his designs grow up very well. When the native grasses take hold, Verdura will successfully fulfill the Forte Collection’s dream for an outstanding luxury golf destination for continental Europe. That was Mike Hughes of the National Golf Course Owners Association. Hughes points out that remote and excellent golf courses golf courses are the movement in golf today. He cites the successes of golf courses like Bandon Dunes, Cabot Lakes and Barnbougle Dunes. A remote stretch of land between Tampa and Orlando changed every expectation about Florida golf. The Mosaic Company, a phosphate mining company and the design teams of Ben Crenshaw/Bill Coore and Tom Doak did that. The two design teams build of golf courses that reward strategic golf. Using holes of classic design, the design teams create golf courses with great artistry. They shared visions at Bandon Dunes on Oregon’s Pacific coast and at Barnbougle in Tasmania. The press has given these courses exceptional rankings in the annual “best of” golf course polls. These courses share a similar philosophy but Coore/Crenshaw and Tom Doak never worked together. 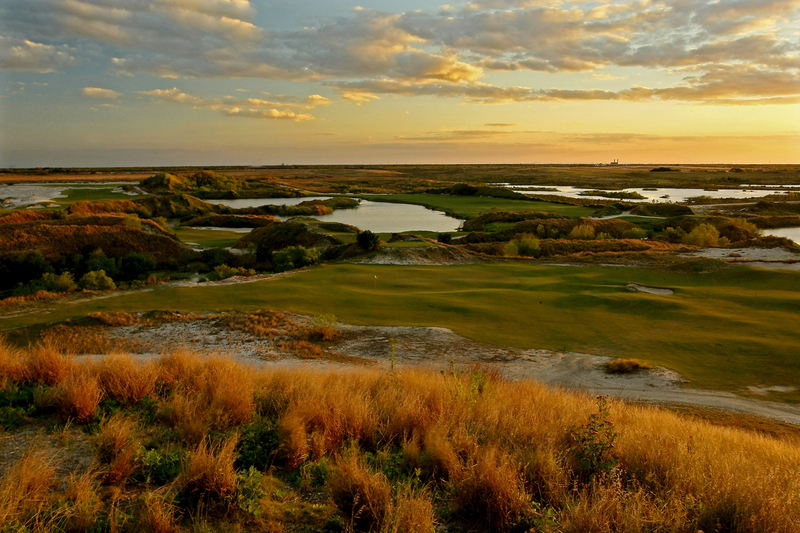 The back story of the Streamsong Resort is almost as amazing as the golf course itself. The owner is the Mosaic Company. They are the world’s leading producer and marketer of concentrated phosphate. The site for the Streamsong Resort is on land recovered by Mosaic from a former phosphate mine operation. Mining phosphate disrupts the environment. Reclamation efforts developed over the past 30 years have been successful. Mosaic donates thousands of acres of reclaimed land to local governments. Many species of animals on land reclaimed for recreation parks and habitats for wildlife. Threatened animals and plants including the threatened scrub jay are returning. Much of this restoration is on Mosaic property. Rick Mack is a Mosaic Vice President. Rick is also a golfer and thought the property in Florida would be ideal for a resort golf course. The property’s reclaimed sand would be a perfect base to establish fairways and greens. The native and man-made terrain would provide a spectacular stage for playing world class golf. His idea was so vivid he convinced a board of mining executives to share his vision. The mining activities have created dramatic landforms that make for great golf holes. Streamsong’s site is unlike any other golf course in Florida. Tom Doak concurred, saying: “This is such a good piece of land for golf. The variety of contours created by the mining process is unique for a project in Florida, or anywhere in the Southeast.” Both teams have enjoyed the collaboration. The former phosphate mine sits 20 miles from the nearest city, Lakeland. Both teams have enjoyed the collaboration. That’s what the forward thinkers at The Mosaic Company hoped would happen on. The former phosphate mine sits 20 miles from the nearest city. Lakeland is about halfway between Orlando and Tampa. Remote is an understatement for this remarkable golf site. The only sounds heard are the wind and the cutting machines. It’s a shock to the senses to play golf in this kind of peace and quiet. The Streamsong site is 16,000 acres large. 4,000 acres is the initial size of the resort. Along with the golf courses are a clubhouse and a hotel with conference center, restaurant and retail area. Streamsong’s main resort building includes 140 guest rooms, bars, restaurants and a spa. For groups there are five four-bedroom villas. The clubhouse also offers 12 guest rooms, a steakhouse and bar along with a professional shop. 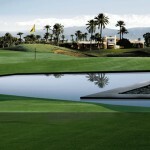 The golf designers use the available space with elevations, natural bunkering and water hazards. The walks from green to tee are not extreme, fairways are wide and accepting with mowed and irrigated rough. is Not only can you walk the courses , except for a few holes, you could play the course on the ground. Site lines and backdrops are nothing less than dazzling. Massive dunes and elevations from the reclamation are jaw dropping. There will be no memberships at Streamsong. It will only be a resort format, setting the bar of hospitality at the highest standards. Hosting competitions at Streamsong will not be a motivating factor. A refreshing change from the “Championship” yardage behemoths that are overtaking golf’s mindset. There are questions about the remoteness of the location. Streamsong intends to make this an ideal retreat for vacationers and conference attendees alike. 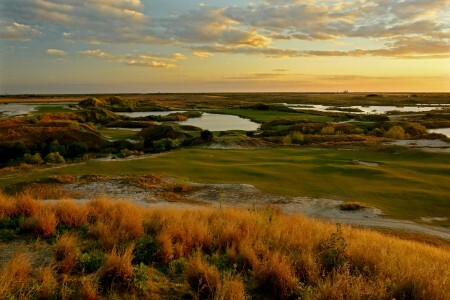 Streamsong offers a view of natural Florida not found at the high-rise coastal hotels and theme park resorts. Streamsong also helps boost the local economy. It added hundreds of jobs during construction. There will be more than 200 permanent positions for the operating resort. Streamsong will generate extensive property and hotel bed taxes. The potential for future business and residential investments in the area are likely. This “multiplier effect” will boost the county’s tax base and tourist revenue. The real significance of this project is what it may say about golf’s future. Streamsong is demonstrates how environmental sustainability and economic growth can work together. For the many Swedish golfers who visit Florida every year to not put Streamsong on your list of places to play would be, in a sense, their loss. Luckily, you can start making your plans to visit now. Aerial view of hole #8 on St. Leon. Not far from Heidelberg lies the Golf Club St. Leon-Rot, one of the most interesting golf clubs in Germany. The club, founded in 1996, is the brainchild of SAP founder Dietmar Hopp. 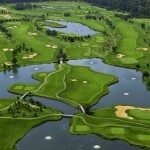 The Golf Club St Leon-Rot is a high-end private facility with two 18-hole championship courses, St. Leon and Rot. It hosted the Deutsche Bank – SAP Open, a professional golf tournament on the PGA European Tour, four times. The world’s best players have played St. Leon-Rot. Tiger Woods has won the Deutsche Bank-SAP Open three times. 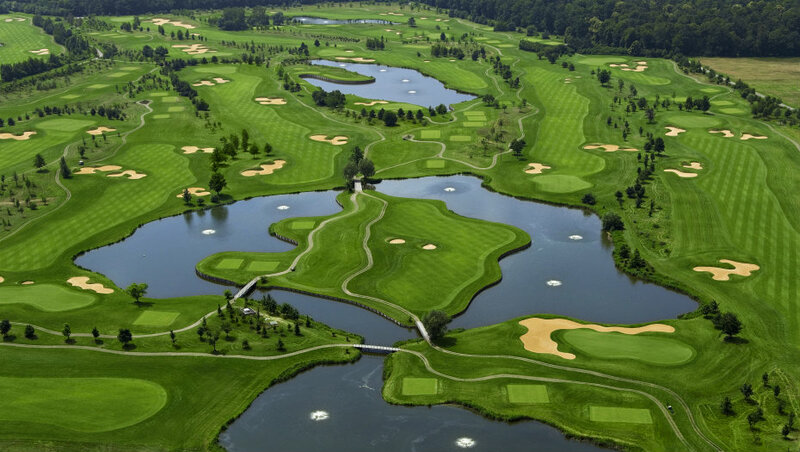 The Golf Club St. Leon-Rot is not only one of the best golf courses in Germany but has established itself as a top European destination. As proof, this stunning complex will host The Solheim Cup in 2015. For the first time in Solheim Cup history both tournaments, the Solheim Cup and the PING Junior Solheim Cup, will play at the same club. In 2015, the Solheim Cup will be the largest sports event in Germany. St. Leon, with many water hazards, requires length and precision. 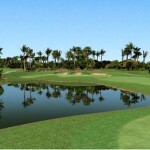 St Leon has undulating fairways, abundant deep bunkering and well built greens. Some traps look more difficult than they are. They feature huge faces but flat surfaces making it easy to escape from unless right underneath the lip. Kept in immaculate condition with greens that roll well and can pick up speed when prepared for tournaments. Almost every golfer has played to an island green somewhere. But what golfer has mastered an island fairway? The rather short 308 yard par 4 # 8 on the St. Leon course is not only scenic but is one of the most dramatic holes in Germany. You need two shots over water, a precise drive and a well-placed shot to the green here are necessary to secure a chance to par. The hole design is ​​more difficult still by placing fairway bunkers in the landing area of the tee shot. Furthermore, a green side bunker protects almost the entire green. Pound Ridge Golf Club, Pound Ridge N.Y.
Golfers leave their clubs at home visiting New York City. Still, there are some exceptional golf experiences, one within an hour of midtown, that may make you change your mind. Pete Dye is a familiar name to golfers. Recognized for designing the famous island hole at the TPC Sawgrass, Dye is a risk and reward designer. Pound Ridge is Dye’s first design in New York. Carved out of 172 acres of cliffs, rivers and wooded hills, Pound Ridge is Beauty AND the Beast. The beauty comes from the wetlands, rock outcroppings and mounds covered with fescue. The beast in Pound Ridge is the devious greens, short rough like steel wool, forced carries and scores of bunkers. Like we said, Pound Ridge is US Open – worthy. Pound Ridge is less than an hour north of New York City and less than 15 minutes from Stamford or Greenwich, Conn. 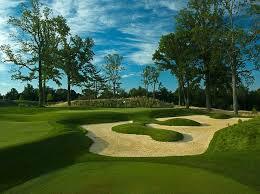 Pound Ridge is an 18-hole daily fee public golf course that measures 7,171 yards from the tips. Opened in July 2008, Pound Ridge has five sets of tees allowing all players to enjoy the strategic layout. The clubhouse has a cozy professional shop, café and lockers, but a new, and full size club house is in the works. Pete Dye says of Pound Ridge, “The ambience of Pound Ridge is unusual. The rocks here have become an asset, you could not afford what we have done here if we had to buy the rock. The things that have made (Pound Ridge) difficult to build have made (Pound Ridge) beautiful.” Indeed, it is. There are a few blind shots, sharp doglegs, some wetlands and plenty of uneven lies and frightening bunkers. The key to success is knowing where your golf ball is going to go and planning the right shots. It’s as simple as that. Golfers need to at least bring their “B” game, no matter what tees they play. Thanks to Mike Bailey for his contribution. The town of Formby, just north of Liverpool, was home to wealthy cotton merchants of the Victorian Era. In 1884, a group of 24 businessmen launched the Formby Golf Club situated between Southport and Liverpool. In that same year, 1884, an important change in England’s social structure happened. It was an amendment added to the Married Women’s Property Act. That amendment said that women were independent and separate persons. Women were no longer a possession of their husband. Women started to enjoy outdoor activities from this new independence. Bicycling, croquet and tennis became popular along with golf, particularly. By 1896, the men of the Formby Golf Club faced a dilemma. So many women were playing golf at Formby, that the men of the Formby Golf Club were losing tee times. Yet, unlike some other golf clubs, Formby did not limit access to women golfers to one day of the week. Neither did it ban women from playing altogether. The men of Formby did something extraordinary. The Formby Golf Club leased the undeveloped property in the middle of their golf course to the women golfers of Formby. To design a nine-hole golf course, they hired Willie Park. At that time, Park was a noted golf course designer and former British Open Champion. Founded in 1896, Formby Ladies has become a charming golf course close to the shoreline of the Irish Sea. During World War I, golf play continued on Formby Ladies. After the war, Harry Colt added nine more holes to bring it to its present 18 holes. During WWII, conscripted men tended to war time duties. The greens chairman, herself, cut the grass on Formby Ladies by using a two wheeled carriage called a trap pulled by a horse. After a visit to the course, two-time Open Champion Greg Norman wrote in a letter to the club. “Over a hundred years old and still your course can stand the test of time. What a beautiful course. It shows that courses do not have to be 7,000 yards-plus to be formidable,” wrote Norman. Measuring 5,374 yards, the course challenges golfers with a variety of small greens and sandy bunkers. The narrow fairways and the rough of heather at Formby Ladies demands thought and accuracy on every shot. Formby Ladies Golf Club is a links course, but as it sits amongst the pine trees and sand dunes, you could mistake it for being otherwise. When asked what the differences is between the two clubs , Daphne points out that the men’s club has a much larger membership. Formby Ladies has a rich tradition of volunteerism to carry out the necessary duties of the Club. Nowhere is the woman’s touch more obvious then the clubhouse at Formby Ladies. The unassuming one story building contains a pleasant changing room. But it is the delightful sitting and dining area that charms you. It is a small multi-purpose room where they serve afternoon teas and light meals in a sedate and genteel atmosphere. One can imagine the women who have sat in that same room through the club’s history. The room has changed little. The club’s memorabilia and golf awards adorn the shelves and the wallpapered walls. There’s a classic picture of Queen Elizabeth II on another wall. The furniture is delicate and light in color, the opposite of the overstuffed leather and dark mahogany of the Formby club. Establishing a golf course today for women, and operated by women, it would praised as some new chapter in modern women’s golf. Formby Ladies is now closing in on its 120th year of doing that exact thing. This unassuming and charming spot in the middle of one of England’s storied golf areas continues today as it did over a century ago. The Formby Ladies Golf Club provides golfers of all genders and ability the same conditions to play this great game. Costa Brava, in sunny Spain, offers some of the finest golfing in Europe. One of the best golf clubs in this golf lover’s paradise is Golf Girona. They say that one of the keys to success is location, location, location. Golf Girona enjoys a privileged location. Only 4 km from the ancient city of Girona, Golf Girona is an hour’s drive north from Barcelona and the Pyrenees and France to the north. Golf Girona designer was the esteemed F.G. Hawtree, founder of Hawtree Ltd. Hawtree Ltd. The course at Girona Golf Club still stands as one of his best designs. The front nine is a demanding challenge while the back nine offers superb views, as well. Both nines loop back to the club house. 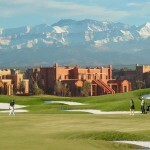 Utilizing the natural contours Golf Girona offers the visitors a true experience. The standards of Hawtree continue because of the excellent maintenance. 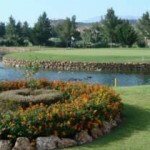 It is the only course in Spain with Penncross grass, the highest quality grass for golf. Like most Hawtree designs, the course settles in the terrain in harmony. The golf course meanders between the valley and hills. You will get the sense that your group is on the course alone. The hills also form a perfect windbreak on windy days. My visit to Girona Golf was one of those good news/bad news days. First, the bad news. The tourist board will frown, but it poured rain. As in buckets. When it wasn’t pouring, it drizzled. That’s the bad news. The excellent drainage of the course was the good news. There was no standing water anywhere on the fairways and greens. The round was as pleasant as playing in the rain can be. A tip of the hat to Hawtree’s design and the outstanding maintenance work of the Girona Golf crew. Girona Golf tells visitors there are five “G’s” they think will help you remember what Girona Golf is all about. They are Girona, Golf Girona, Grande, Gourmet and Good Service. I can vouch for all five. Girona is a beautiful city with a history that dates back to the Greeks. 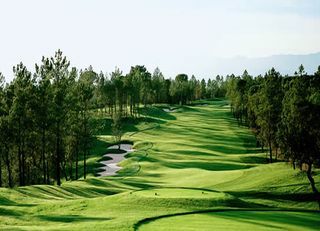 Golf Girona, despite that day’s weather, is a scenic and challenging golf course. It deserves the reputation that it has in Spain. Grande means large, with a clubhouse that is over 32,000 square feet built of glass and natural stone. The clubhouse contains meeting rooms, comfortable common areas, restaurant, snack bar and pro shop. Girona Golf also has a full size children’s play room. Gourmet goes without saying. Catalonian cooking is so good that delicious meal are common in this area as are the meals at Golf Girona. Every bite I took from the chefs at Golf Girona was passion on my palate. Finally, the fifth “G” stands for Good Service, as it should. Every one from the receptionist to the waiter to the grounds crew makes sure you are well taken care of. The five “G”s more than compensated for the weather. You’ll come away from Golf Girona in a warm and sunny mood.